Fox Sports reporter and "Dancing with the Stars" veteran Erin Andrews will take her turn at hosting the ABC competition series, ABC confirmed on "Good Morning America" Monday. The 17th season premiere of "Dancing With the Stars" was a veritable emotional roller coaster for contestants, their families, the judges, and fans. Needham's own Aly Raisman romanced the judges with her strong performance Monday night. During "prom night" on ABC's "Dancing with the Stars," the Olympic gymnast and her partner, Mark Ballas, performed the Viennese Waltz to the song "Give Me Love." Judge Len Goodman initially surprised the crowd when he said, "Up until tonight, I've been really impressed with your dancing. Not so much tonight." Luckily for Raisman, he was making an April Fool's joke. Judge Bruno Tonioli was impressed with the 18 year old. "We were all swept away, he said. "You express it so well for someone so young." The main criticism she received was from Carrie Ann Inaba, who said Raisman wasn't "quite confidant in the character.” Despite the criticism's, Raisman and her partner picked up 23 points from the judges. Before her performance, Raisman talked about how she was able to show her romantic side during the waltz. Although she’s never been in love, she finds inspiration elsewhere. “I watched a lot of movies before, so that helps," she said. Country singer Kellie Pickler and partner Derek Hough had the highest score of the night with 25 points. Inaba gave the pair high praise when she said the dance was "ridiculously amazing." Disney actress Zendaya Coleman and partner Val Chmerkovskiy tied in second place with NFL player Jacoby Jones and partner Karina Smirnoff, while Raisman tied in third place alongside boxer Victor Ortiz. The contestants will find out which dancer has to return home during the elimination show on Tuesday at 9 p.m. on ABC. ABC's "Dancing With the Stars" premieres tonight at 8 p.m. Hosts Tom Bergon and Brooke Burke-Charvet will introduce 12 celebrity hopefuls and their pro partners for the season 16 opener of "DWTS." This season's celeb cast ranges from Olympians (including Needham's Aly Raisman) and comedians and adds three new professional dance partners into the mix. Do you plan to watch? Have you already selected a favorite? Let us know in the comments! Correction: An earlier version of this blog post stated that NBC's "The Voice" would premiere tonight; instead, the show returns on Monday, March 25, at 8 p.m.
"Good Morning America" announced the full cast of ABC's "Dancing with the Stars" this morning. The cast members of the 16th season were at the show for an appearance, where they also revealed their professional dancer pairings. This year's cast features several professional athletes, including two Olympians: Needham's own gold medal gymnast, Aly Raisman, and '70s skating world champion, Dorothy Hamill. Professional dancers Lindsay Arnold, Sharna Burgess, and Gleb Savchenko are making their first appearances as partners to the stars this season. Read more about the contestants and see photos of them here. What do you think of this year's cast? Who do you think will walk away with the disco ball of glory? Comment here. Do you prefer "fashion victim" or "ensembly challenged"? : The cast of "Clueless" reunited for an Entertainment Weekly photo shoot for the mag's "All-Star Reunion Blowout" feature and sat down with "Good Morning America" to talk about their iconic '90s teen flick. While the late Brittany Murphy (a.k.a. Tai) was missing from the group, the cast reflected fondly on their scripted Beverly Hills high school years. When asked what they thought their characters would be today, Alicia Silverstone (a.k.a. Cher) was quick to the kicker: "married to her brother." Like, duh. Bye, bye, bye: Meanwhile, on the second elimination episode of "Dancing with the Stars: All-Stars," Joey Fatone and his pro partner, Kym Johnson, were booted from the disco ball trophy running this week. The pair performed a quick-step to one of the strangest renditions of Radiohead's "Creep" we've ever heard in episode 3, leading them to a relatively solid score of 22.5. (Judges are really loving their ability to tack on those half points this season.) But they were unable to wow in the end -- getting the boot from the bottom two, saving Helio Castroneves and Chelsie Hightower. Next week: double elimination. What not to do when you're expecting: And finally, put your fists in the air, because the sixth and final season of "Jersey Shore" kicked off on MTV this week. The housemates wasted no time letting us know that this season won't be quite the same. Snooki's with child, Mike's just out of rehab, and Deena and J.Woww both are in committed relationships. But then again, some things never change: Vinny and Pauly D. rekindle their bromance to the max while Sammi and Ronnie are dating, but not dating, but totally dating. But only when she's not being lame or when he's not drinking. It's very complicated. But at long last and after five seasons, the producers are letting them officially share a room in the house together. The season premiere also comes with the announcement that Snooki, being the responsible mom-to-be that she is, wants to get her own place, where she won't be tempted by tequila shots, house music, and other non-maternal pleasures that flow freely on the shores of Jersey. What did you watch this week? Did you catch the premiere of the last season of "30 Rock"? Did you see Boston's own Caitlin Michael's on "The Voice"? Or were you busy defending the honor of Big Bird on Twitter post-debate? 'Dancing with the Stars: All-Stars' premiere: What did you think? Last night the first episode of "Dancing with the Stars: All-Stars" kicked off with the contestants competing for a second chance at the crown after three weeks of preparations. (Check out the "All-Stars" cast and dance pro pairings.) Notable moments of the night included Kirstie Alley (who is dancing with Maksim Chmerkovskiy, who recently announced his departure from the show after his contract is up) planting a kiss on Emmy-winning host and Haverhill native Tom Bergeron's lips, Bristol Palin finally letting loose with mom in the crowd, and the new ability for judges to award half points (a rule of which they fully took advantage). Retired footballer Emmitt Smith and Cheryl Burke topped the scoreboard with a 24.5 for their cha-cha, while former Baywatch babe Pamela Anderson and Tristan Macmanus trailed the pack with a 17 for the same dance. Check out highlights in the video above and comment here to let us know what you thought of the season opener. Any favorites so far? "Cheetah Girls" actress Sabrina Bryan was announced as the 13th and final competitor for the upcoming "All-Stars" season of ABC's "Dancing with the Stars." The actress/singer was up for the "Viewers' Choice" spot against fellow Disney alum Kyle Massey and sassy fashion commentator Carson Kressley. Bryan will partner up with dance pro Louis van Amstel, who proudly told Good Morning America, "This is the first season I can knock myself out as a dancer, as a choreographer because she’s so good." Bryan previously competed in season five of the series with partner Mark Ballas before facing elimination during week six. Ballas will perform with Bristol Palin for the "All-Stars" season, which begins on Monday, Sept. 24, at 8 p.m. Thoughts on Bryan joining the cast? Comment here. The pairings for the upcoming season of "Dancing with the Stars: All-Stars" were announced this morning by ABC. EW.com broke down the announcement into two categories: 1. partnered in the past, and 2. new pairings. and Melissa Rycroft and Tony Dovolani. and Shawn Johnson and Derek Hough. The network still has one all-star slot open and is giving viewers the chance to vote for "DWTS" alum Carson Kressley, Kyle Massey, or Sabrina Bryan to join the show. The season begins Sept. 24 on ABC. Are you excited for the upcoming season of "Dancing"? Do you have a favorite pairing from the above? Or do you think one of the all-stars deserves a different partner? Comment below. After 10 weeks of highly entertaining performances and phenomenal dancing, Donald Driver and Peta Murgatroyd were crowned "Dancing with the Stars" champions, on the two-hour esason finale of "Dancing with the Stars the Results Show" on Tuesday May 22, 2012 on ABC. 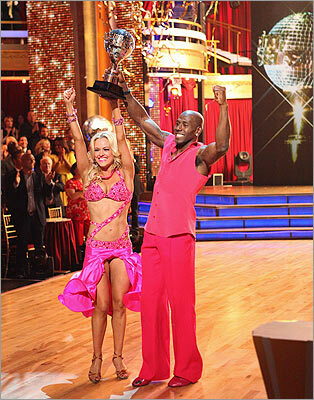 Football star Donald Driver made it all the way as the season-14 winner of "Dancing With the Stars." Driver and his professional partner, Peta Murgatroyd, had been standout dancers all season long, but they really impressed the ballroom with their country-fied freestyle. Opera singer Katherine Jenkins, who landed a perfect score the night before, came in second place and Cuban actor William Levy took third. Do you think Donald Driver should have won 'Dancing With the Stars'?